Its that time of year to start booking in your ice fishing excursion’s for this up coming 2017 winter season. Last year we barely got enough ice in the region to safely be able to take clients out on the hard water. This resulted in many local outfitters closing up shop and cancelling trips, local tournaments. Many local fisherman were left frustrated and disappointed. 2017 at the moment is starting to look better however only time will tell. If you want to start thinking ahead and want to have the best chance at getting onto the ice this coming winter, we are already working hard to keep trails open to our many different lakes to be able to give you a ice fishing adventure of a lifetime. 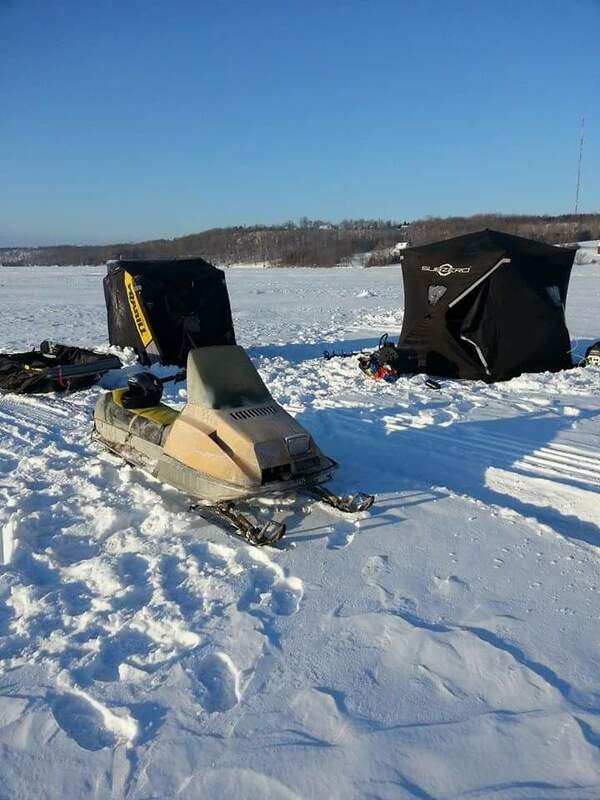 Check out our many options we are able to provide you this year by going to our ” ice fishing Package page” and select the trip that best suits your desires. call us soon as availability is slimming. First I wanted to thank everyone that has made this year an encredible year. 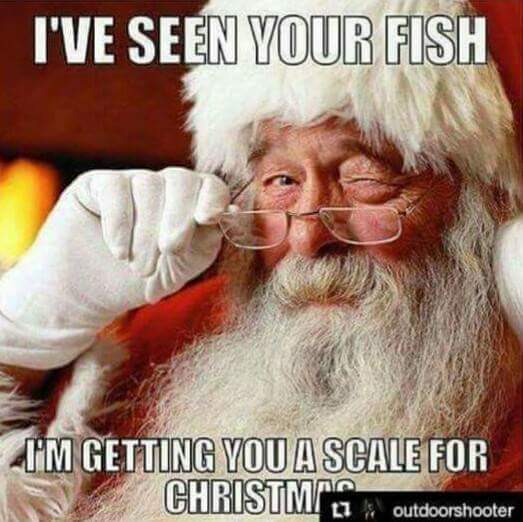 #FishbumOutfitters , #SeafourLures , and #LiquidMayhem , you guys have helped with putting, well, too many fish to count on the deck of my boat and my friends boats during 2016. All the people that have come out fishing with me, without you guys I would not have the opportunity to live life to the fullest and do what I love the most. I want to give a special shout out to a couple people that have contributed to some of my sucesses this season. First Kevin Gibson, We only met and started fishing together in the spring but I have learned a lot from you and gained a good friend. 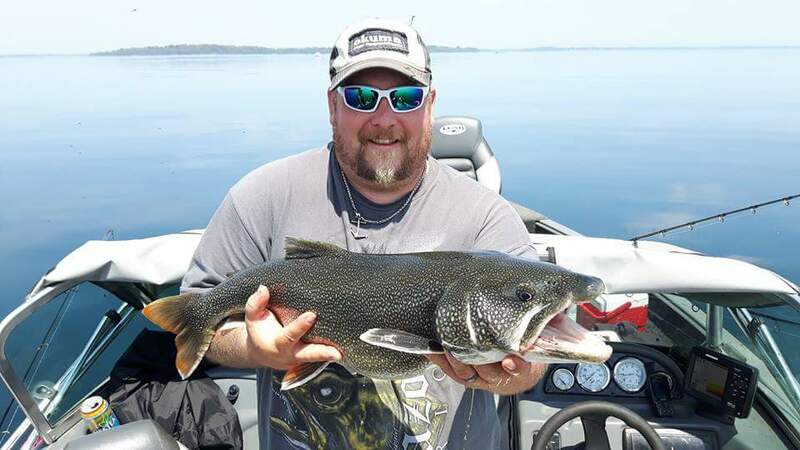 Some of my favorite times on the water was with you this year, from catching monster Lake trout, and salmon, helping to put the first walleye’s in your boat, to getting skunked on a midnight run in the middle of Lake Ontario, what a blast ha ha ha. 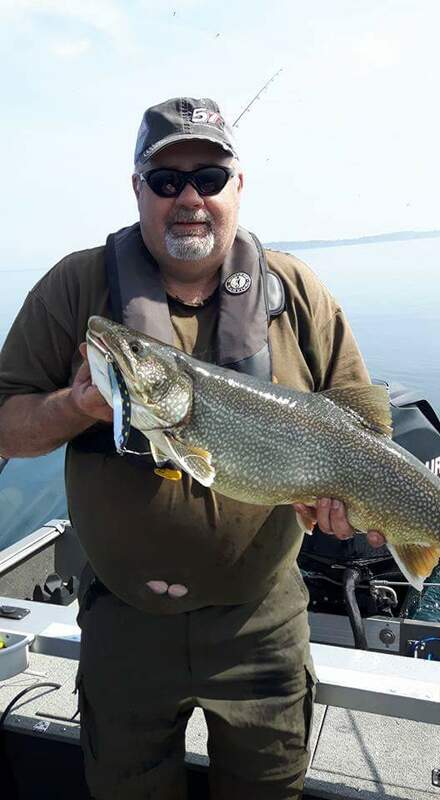 2nd To all my fishing friends and competition in the Bay Of Quinte, you guys have shared your thoughts, given advise, and helped me along the way to get me where I’m at now, I know I have a long way to go but you guy’s give me something to strive for. 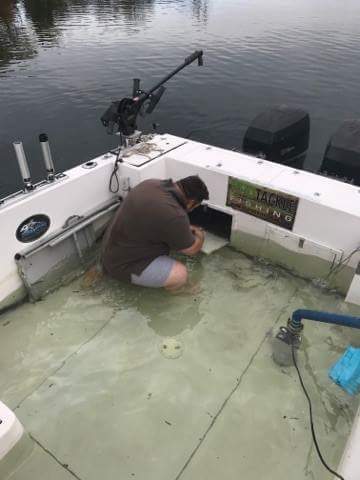 3rd To Tony, My Boat Mechanic, thank you for helping to get my boat up and running when several others tried and failed to do what you were able to do. 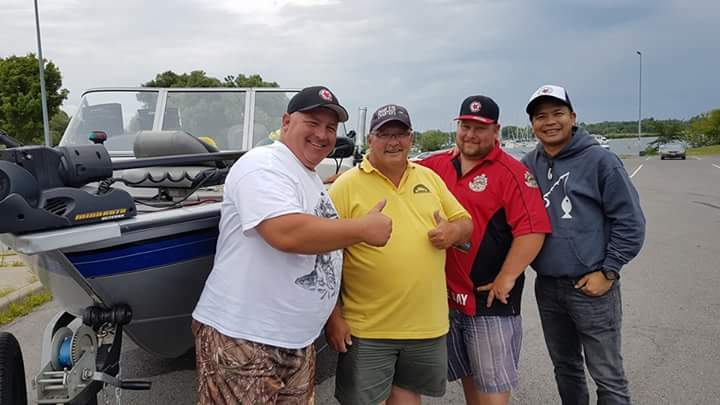 4th To Scottie Martin and Red Andal, with The Canadian Fishing network, you guys were a blast to fish with and showcasing my fishing stories this year has been giving my stories the exposure I was hoping for, you guy’s rock. If you want to see the monster walleye that Ed Mackenzie of Chasin Eyes and myself were able to Get Scottie and Red on them click the link below . 5th Last but definitely not least, of course Ed Mackenzie with chasin Eye’s charters, you have been there for me this season like no other. taking people out last minute when I was stuck helping with showcasing both of us with Walleye Wednesdays, and of course endless other gestures trying to help a brother out. I cannot thank you enough for your generousity. Unfortunatly due to recent sircumstances I had been forced to close my season down early. 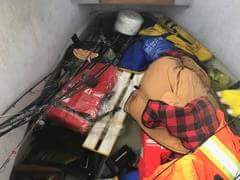 This, due to some mischievous behavior in the Picton Harbor & resulting in my vessel taking on too much water and almost completely going under. It is unclear exactly what or WHO, happened? Behavior like this, and vandalizing property behind someone’s back is one of the most Cowardly acts a person can do in my opinion. Your actions have not only cost me money, which Iam SURE was your intention, but you have taken food off the table in our home, and caused my children, family, and the charities we donate to, to go without this christmas. I do not need you to speak up to say who you are, nor would I expect that based on your cowardess actions , however you should know that your actions create reactions and I’m not sure what my family or children did to deserve the hard times you have and are putting them through. I apologize to the folks that were looking forward to joining me for those open water trophy Eye’s in the Bay this Fall, but never fear Im sure I will get things sorted out and back on the open water again in 2017. Ending on a happy note we are all set for the 2017 hard water season and looking forward to having lots of ice and a successful winter season. The Canadian Empress runs with two crews. The Hospitality and Navigation Crews. I was on the Navigation crew. This consisted of 2 Deck Hands (one on day and one on night shift), a Chief Engineer, a First Mate, and of course the Captain. Our crew worked hard. 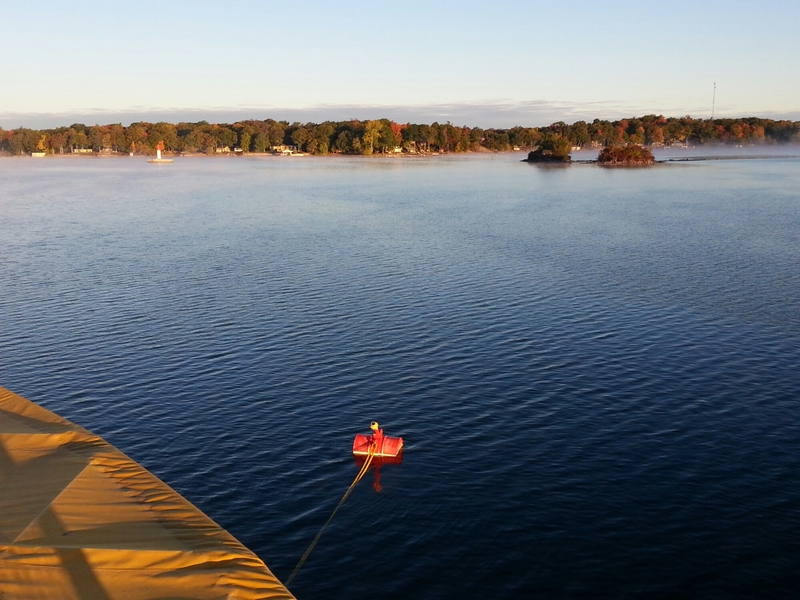 The Navigation Crew is a combined effort that is ultimately responsible for the boat, the crew, the passengers, and getting the boat safely from A to B. As some of you have read in my past posts, my experience has mainly been in the fishing industry when it comes to working on boats. This has been an amazing experience over the past few months. Mate Pap enjoying an off duty, drink I chose for him. With all amusement set aside, I want to take a moment to show my respect to my Officers at the helm of the ship. The First Mate, Mate Pap. Although surprisingly young for this type of position, he takes his job seriously. Mate has completed his courses necessary and has put in the time needed to be in this position. A very impressive accomplishment. My children had the opportunity to meet Mate Pap. While it was slightly amusing to introduce a gentlemen a handful of years older then my kids as my ‘boss’, he was a great example and inspiration to show them what one can accomplish with dedication and determination. I enjoyed working for Mate Pap over the past few months. You need to be a people person when working in this environment and Mate Pap has that down. However the vote is not in yet whether Mate Pap was always being requested for photo ops because of his approachable sunny personality or his manicured, waxed, curly mustache the lady passengers would ga-ga over. Captain Emtage dressed in his blues, helping his crew scrub the back of the Empress at UCV. I have saved the best for last (to clarify, this is considered sucking up), Captain Emtage. This Captain is absolutely remarkable. 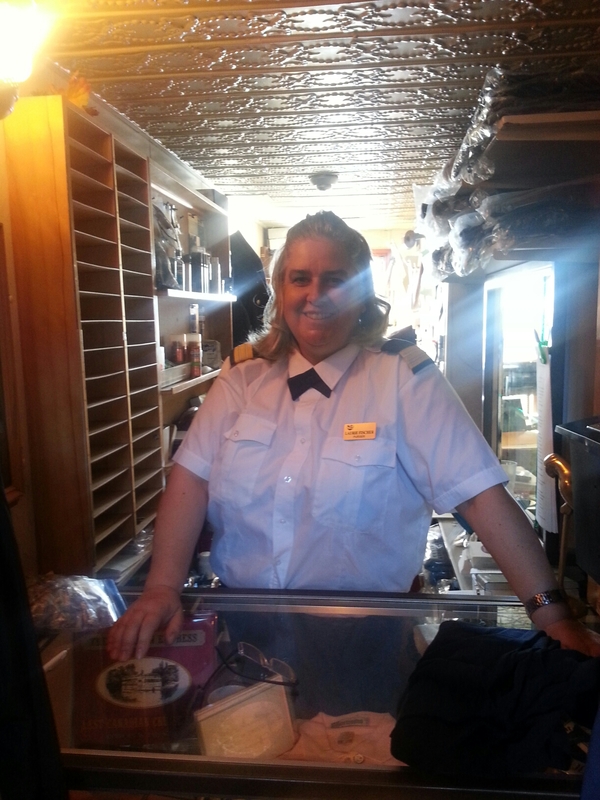 It was a pleasure to work for such a calm, knowledgeable, & professional Captain. Captain Emtage is modest, well respected in the industry, and any company would be better off having this Captain at the helm. He is not affraid to get his hands dirty. He helps his team with tasks when the ship is at dock. And when it is not, he amazes me with his skill. The Captain can efficiently maneuver a large vessel any day, but especially in high winds, in a small harbor ,filled with very expensive boats. The slightest touch would send most of the other boats hurtling to the bottom of the harbor, and Captain puts a 200 tonne boat filled with passengers gingerly onto a small dock with ease. He does this while looking as if he is ready for high tea. I know from experience, this is a very high stress position, however Captain Emtage makes it look easy. I can only dream to be this talented one day. After completing a season of running (more like walking) a marathon with 4 levels, 8 stair cases, 2 ladders, and 5 hobbit like hatches of obstacles I can surprisingly tighten my belt a few holes even with James sizing all my 5 star meals. I have met and heard incredible life stories from the guests aboard the Canadian Empress and have shared many laughs with guests and crew alike. 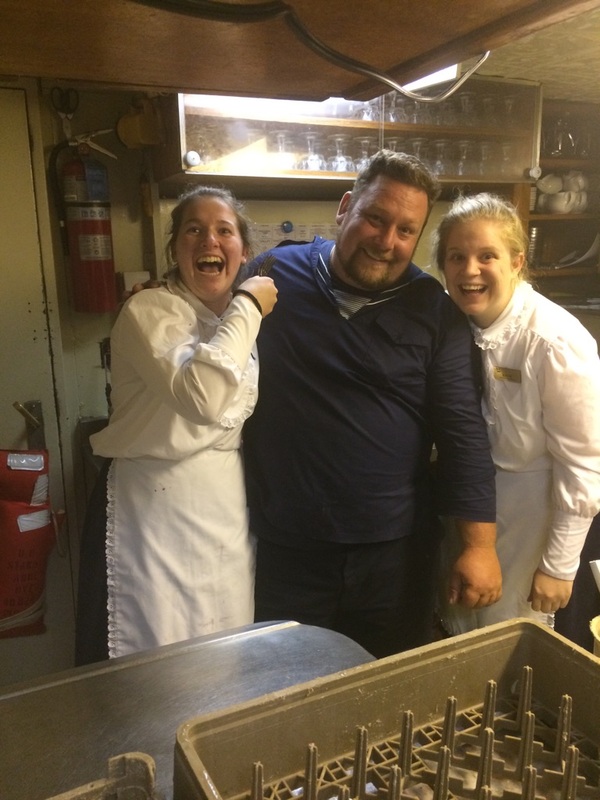 When this crew arrived in Quebec City on that inaugural cruise with me as their new deck hand I am sure they imagined this 300lb man would not be of much use. I feel (and hope they do too after seeing that this large man is not a lazy man), that embarking on this adventure with me aboard, made their jobs easier, made them smile more often, and left them wanting me by their side next year. While my body may need some healing I am happy to announce my boat is now fully repaired and ready to begin Sea’s The Days fall walleye season. As I flip back to position of Captain, sadly I won’t need or have a crew of 13 for support, to tie off my boat, heal my ‘hangry’, or assist my clients going forward this fishing season. But I will see you all in May, hopefully with stripes on my arm (hint hint Jason)! Over the past few months i have learned that every ones job on a cruise ship is just as important as the next. It takes everyone to create a smooth running opperation. 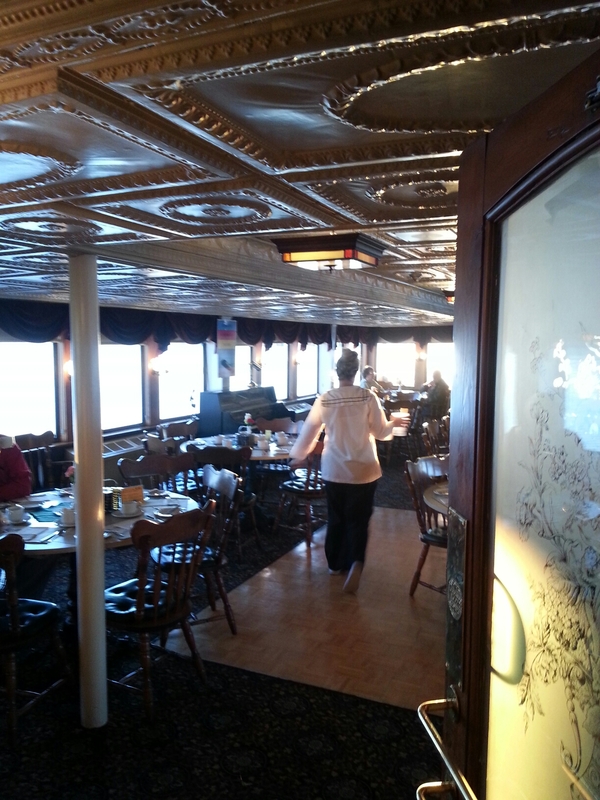 The Galley is the busiest areas of the ship and the Chef and Galley Assistant have an incredibly difficult job. 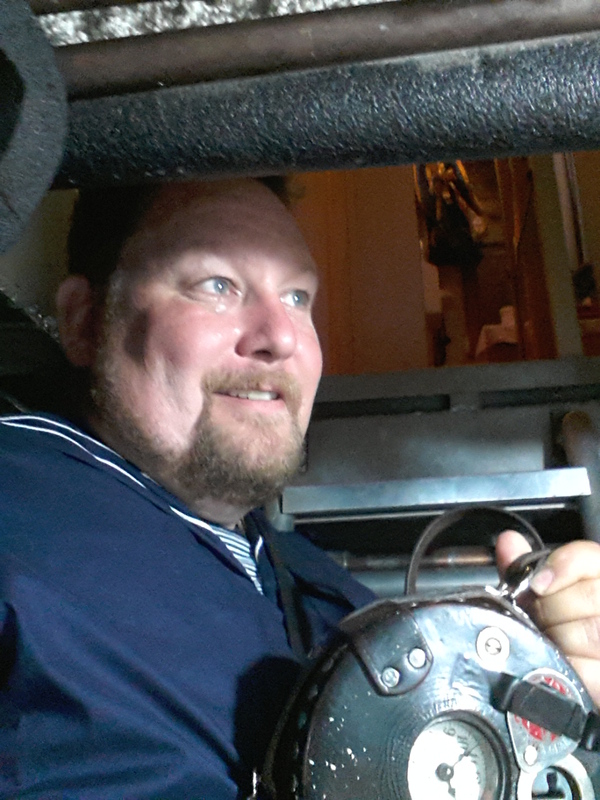 They pump out up to 80 plates three times a day out of a searing hot, tiny compact galley. The food is extrodinary. Don’t piss these guys off or you may not be eating. I try to take care of these two guys the best I can because I need them to cure my ‘Hangry’ disease (for those who don’t understand,this is when an individual becomes irritable, and angry without just cause due to hunger). 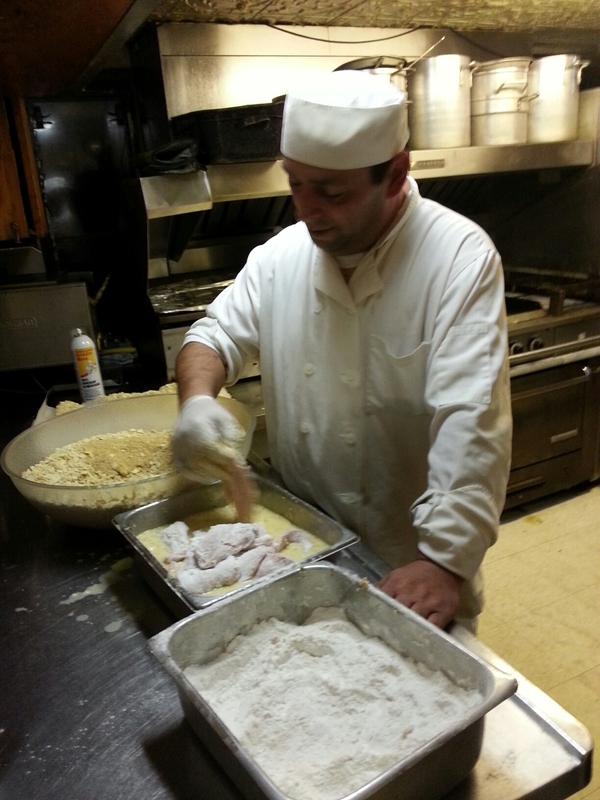 If the chef likes you he will take care of you, and he must REALLY like me. This has not gone unnoticed by the rest of the crew. The Cheif engineer now tells the chef, ‘I am good friends with James, if he is looking for a few extras on his plate. You have heard of super sizing your meal at Mcdonalds,? Well on the Canadian Empress we James size. 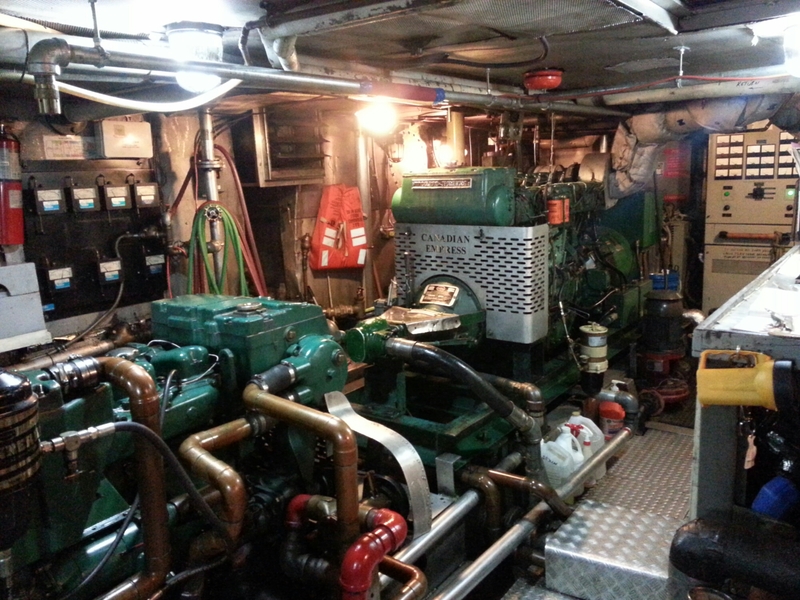 The Chief Engineer keeps the engines running. A ship this size which runs contsant from may to october has no time for down time. This is a feat that requires years of experience, knowledge and hard work. It is a thankless job from those you are providing a service for because to the guest, the Engineer is never heard, or seen. For all those guest who never thought to thank you, I salute you. On the flip side the two most visible crew members who spend their days with our guests are our Purser Lori, and our Bartender Matt. Matt, works the latest shift out of everyone. 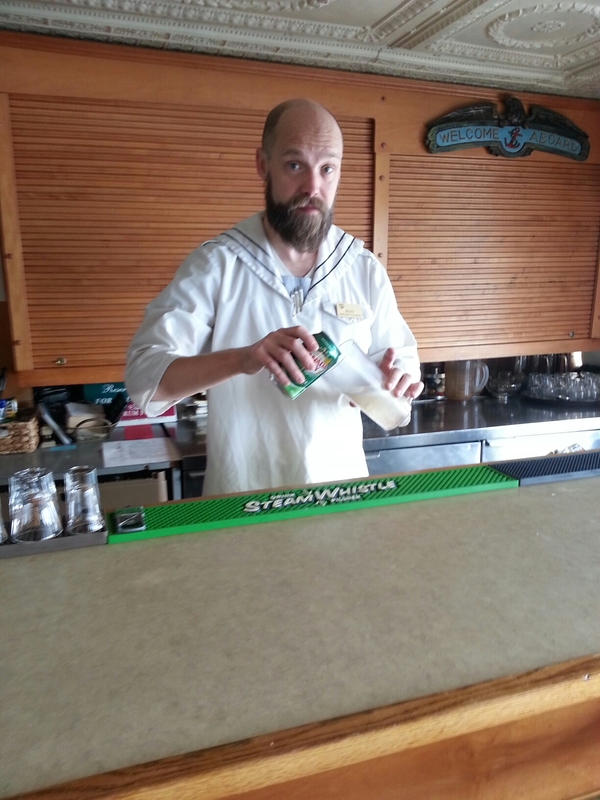 He is stationed at the bar until the last guest retires to their room. Getting to bed hours after anyones shift has ended. I am sure he can top any story any of the crew can recall from the guests. Not only does he have a ear to listen and a bar to lean on for the guest but he has to be knowlegable of all the ports the ship visits. Matt has put up with me with great patients as I harass him to keep me hydrated almost hourly. Without the Purser, Lori, the ships organization would probably get thrown out the hatch. She is the glue of the ship. Lori takes care of all guest logistics, activities, and ensuring we follow protocol. With all this responsiblity she still finds time for humour. 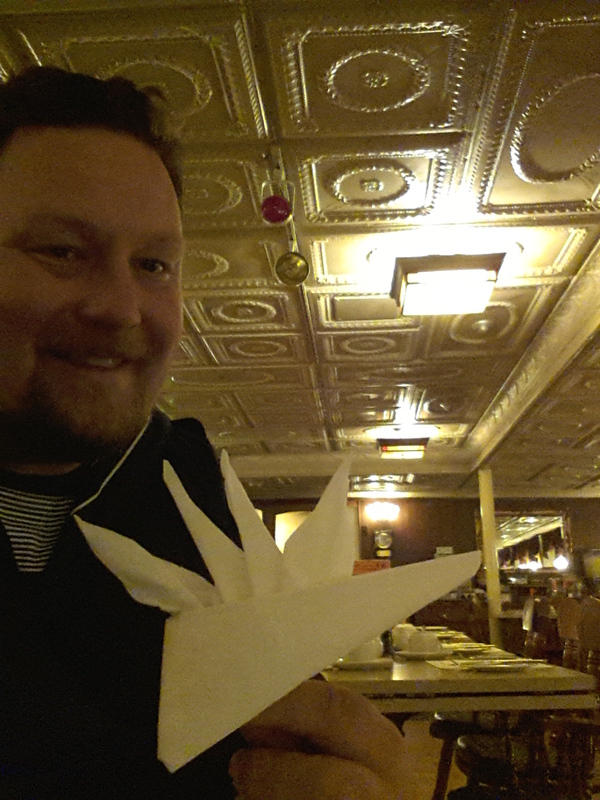 One day she had me believing I was to lead a napkin folding seminar with my new found talent. I entered the saloon to a room of about a dozen, bright eyed ladies, eagerly anticipating my arrival….all I can say, I wore a new shade of red that day. But it was all a ruse and all I was needed for was to collect the garbage. I had never been so happy to haul garbage! Since Mid August, people who care to follow my little adventures, know that my boat has been down due to broken motors. With the costs of fixing my motors, along with the hope of continuing to contribute to the family household expenses, I decided that I needed to get a full time job until the motors were fixed and I could be back on the water full time. While scrolling the online adds, I found an opportunity for a full time position with a reputable Local company, The St Lawrence Cruise Line. The position was for an entry Level Deckhand. I was very interested in this because it would allow me to continue spending my time (while my boat was getting fixed) on the water. In recent years I have found the desire to be on the water growing stronger. I knew flipping burgers somewhere would not surffice and this would be a much better option. I realized in the Interview for the deckhand position, that although it was not a great paying job, it had great potential to turn into an incredible opportunity for me down the road. This was not a dead end position, there seemed to be opportunity to move up in the company at a decent rate, where in the future I may be able to captain such a vessel. Don’t worry, I am not giving up Sea’s The Day! But when I heard that the staff work an equal amount of days on the ship as they get off the ship, I realized it meant that I would have plenty of scheduled days off to be able to run my fishing charters alongside this position. The Job was offered to me. And of course I took the position. I was fit for my uniform, and when I say fitted, I mean they did not have anything big enough. With a 6 week wait time on uniform delivery I needed to take what I could and squeeze into them like stuffing a large hand into a small rubber glove. So a few days after being fitted, I was on route to Quebec City to spend 7 days, 24 hours a day, in close quarters, with a crew of people I have never met. A crew that innocently arrived that day not knowing what they were about to embark on, with me aboard.